Signals from FIA and similar systems can be collected with either an e-corder or PowerChrom hardware unit. 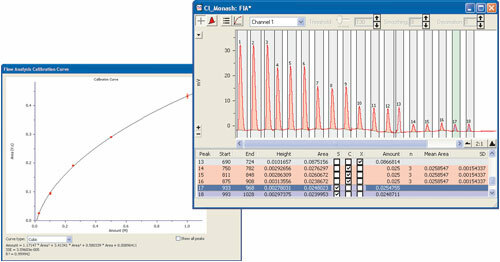 Chart software together with the FIA Chart Extension are used to automatically detect and calibrate peaks. Calibration by peak area or peak height is possible and there are several curve fitting functions available. Results are displayed in user configurable reports. The ER282 Flow Analysis System is a dedicated two-channel recorder for flow analysis techniques. It comprises a PowerChrom 280 hardware unit, Chart software, FIA Chart Extension and Event Manager Chart Extension. Event manager enables the switching of the PowerChrom's TTL outputs for triggering autosamples etc. Suitable detectors for both the e-corder and PowerChrom units require an analog output signal up to ±10 V.
To collect FIA signals using a QuadStat, Potentiostat or other eDAQ Amp or Pod, requires an e-corder. The determination of free fatty acids in vegetable oils (doi:10.1016/j.aca.2011.03.033). Measuring Total Dissolved Inorganic Carbon of Seawater, see the application note.